I learned gratitude, humility, and just what my body and mind are capable of. 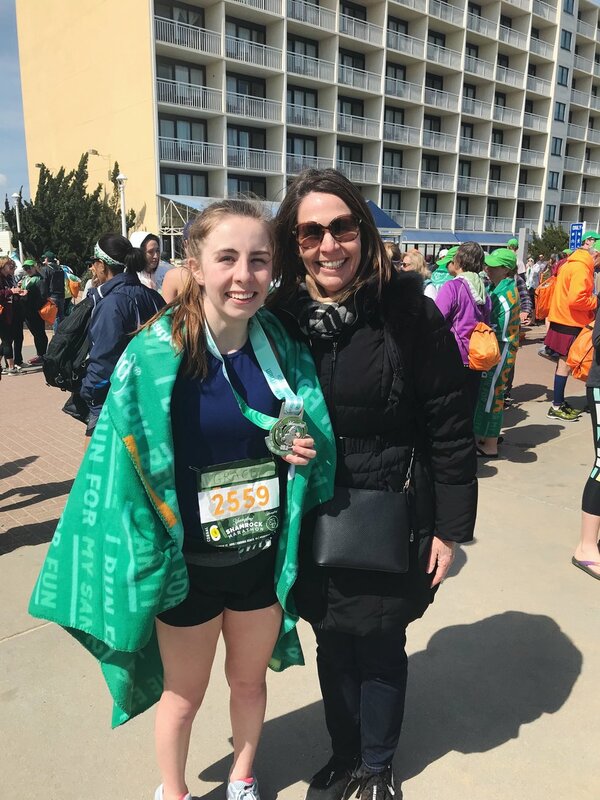 On Sunday, March 17th, 2019, I ran my first marathon. It was both the most challenging and most rewarding experience. Throughout training and the race itself, I learned gratitude, humility, and just what my body is capable of. A year ago, I wrote an article "I Went From a 5K to 13.1 Miles, And I Learned A Lesson Each Time My Foot Hit The Pavement." In my half marathon article, I documented my journey from 3 miles to 13 miles and the toll it took on my body. I could never have imagined that I would push myself further and complete 26 miles. I started training for the Shamrock Marathon at the end of November 2018. Gradually over 22 weeks, I added mileage to my long training runs. I found a new favorite trail just outside of Atlanta called the Silver Comet Trail, put my headphones in, and hit the ground running every Saturday morning. During my training period, I became aware of the differences between training for a half marathon and training for a full marathon. The first difference is obvious –– a full marathon is a whole lot longer. But there are other characteristics of marathon training that distinguish it from other races. Training for a marathon requires an enormous amount of discipline. You cannot skimp out on a long run because you will pay for it on race day. However, I learned that cross-training days are equally as important. In order to maintain your aerobic conditioning while caring for your joints, you must participate in an exercise that is not running. Whether that be indoor cycling, swimming, or circuit training, doing something that is low-impact yet aerobically challenging is crucial in marathon training. You must be willing to make time for your training. Marathon long runs take a while, especially towards the end of the training period. In order to make time for my 18-mile run, I needed to commit to three hours on Saturday morning. This time is sometimes hard to find especially as a busy college student but it is absolutely necessary for success. Good nutrition is imperative. Invest in high-quality energy gels and plan out the foods you will consume for carbohydrate loading. During my training, I was hungry all the time. Doing so much cardio throughout the week means that you are burning significantly more calories than your body is used to. It is so important to fuel your body with balanced meals that will allow you to run further and faster. Marathon training takes a toll on your body. I learned this lesson the hard way. If you don't prioritize your recovery, you may get injured. If I had incorporated a stretching routine into my cool down more frequently and suffered the pain of an ice bath every couple of weeks, I may not have injured my hamstring. Practice, practice, practice. Practice running in the clothes you will wear on race day, practice running with the energy gels you will consume, and practice the nutrition you will have before and after your marathon. On race day, my mom and I woke up early (5 am to be exact). I ate my bowl of oatmeal sleepily and put on my race day workout clothes. We hopped in the car and drove out to Virginia Beach. I was so nervous! But as soon as we arrived, my nerves began to subside. The gun went off to release my corral and suddenly it was really quiet. All you could hear was the thud of shoes on the pavement, and faint chatter between running buddies. But that didn't last long, by mile four, the quiet had turned into loud enthusiastic conversations and cheering from supporters. I loved running this marathon because the course was so special. Miles 6-9 were in the Joint Expeditionary Base Little Creek - Fort Story. Miles 13-16 were along the Virginia Beach boardwalk. Miles 19-22 were through Camp Pendleton, a state military reservation. Despite the pain and exhaustion that increased throughout the race, the interesting course and sights we passed made the marathon much more enjoyable. By far my favorite part of the marathon was the last three miles. As soon as I hit mile 23, I felt a wave of unexpected emotions. Tears welled up in my eyes as I realized I only had a 5K left until the finish line. The fact that just two years ago, 3 miles was the furthest distance I had ever run was astounding. Maybe it was the exhaustion and delusion setting in, but I couldn't shake the feeling of pride of how far I had come. I rounded the corner back onto the boardwalk and saw the large banner "FINISH." The crowds were cheering louder than at any other point on the route. The announcer called my name as I crossed the finish line at 4 hours 35 minutes 31 seconds. I immediately searched for my mom in the crowd, and I found her face with tears streaming down her cheeks. Despite injury, months of training, and a tough four hours of running, I had finally finished a marathon. It has now been three days since I crossed the finish line. My legs are incredibly sore and I can barely walk but the pride and sense of accomplishment have not subsided. I know now that my body can do anything if my mind will allow it. If I truly want to achieve something, it will happen. I have had a goal on my bucket list for quite some time. But I never wanted to share this goal because I was afraid I wouldn't be able to complete it. The goal was to run a marathon before I turned twenty years old. I am so proud that I can check that off the list. I would recommend running a marathon to anyone. Yes, it is one of the most physically demanding things you can put your body through, and the training requires dedication and perseverance. But I promise it is worth it. It will teach you how strong your mind is, how to be humble, and how to love your body and all that it can accomplish.